I'm working from home today and I'm a little anxious. Blossom (my youngest) has scratched her cornea. She doesn't know how she did it, possibly something was in her eye - a piece of grit - and she's rubbed it. I sent her off to school yesterday, bad mother, though it was sore but we'd eyedropped and she wanted to go. Still..... bad mother. School rang of course and I bundled her off to the doctor. The doctor thinks it's not too deep and she applied some ointment and whacked on an enormous eyepatch which is totally mortifying to a 15 year old. We had to sneak out the back door of the clinic, lest anyone see her pirate look. 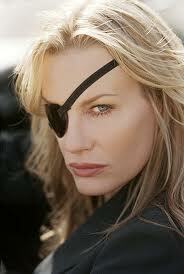 Daryl Hannah can carry it off though. It was itchy and hurting last night and she lurched between laughing about it and being in tears. Teenage hormones are a challenge! The Man is, of course, away so it's just me. And one of our dogs, Harry, opened up a sore behind his ear where the dog clipper nicked him so I had to patch him up too. Florence bloody Nightingale I'm not. In these sorts of emergencies, only wine and chocolate will suffice. We're back to the doctors at noon, am hoping it will be good news.